On Wednesday, venture capital firm Kleiner Perkins Caufield & Byers released its annual Internet Trends report — the highly anticipated study from KPCB partner Mary Meeker. Meeker, in past years, has focused her presentation on the business and market opportunity of individual tech sectors. In 2014, Meeker assessed where, when and how messaging apps, big data, and connected devices would boom. Nearly half of the new report examines how people’s Internet habits are changing the way they make a living. Here are six of the highlights from Meeker’s 2015 Internet Trends Report. 1. 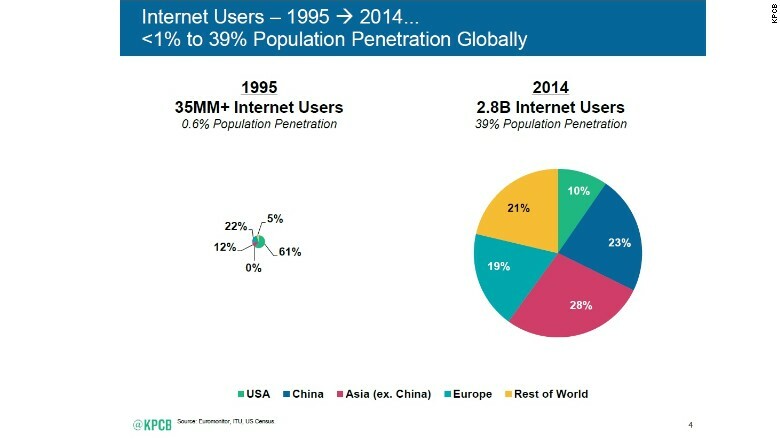 Today there are 2.8 billion people connected to the Internet, which is up from 35 million in 1995, when the Internet Trends report was first published. That’s still only 39% of the world’s population.